The doublet is made after various pictorial evidence from 1450-1460, Italy. The outer fabric is a thick wool, while the doublet is lined with a strong light gray linen. The classical Italian style from this period is characterized by the puff sleeves and a standing collar, which goes into a V in the back. 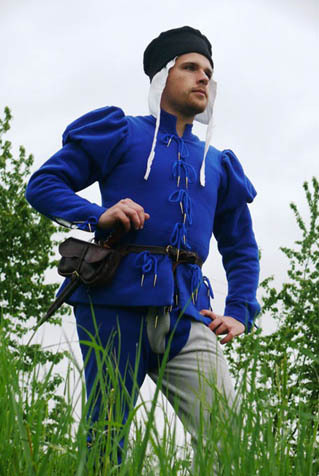 The costume also consists of mi-parti woolen hose with an inverse codpiece.